Well, after 2 separate illnesses in the last 7 days I will be going to my Faber class tonight even if I’m dying…because tonight they’re critiquing the first 5000 words of Still ARGHHHHH! Last weeks list was…not a complete wash out surprisingly enough. I was shocked that between a nasty cold and a stomach bug, I did actually manage to get something done! 2. Add at least 5000 words to Still. I added 2000, which is better than nothing. I’m finding that around 600 words each day I’ve added to it, seems to be comfortable for some reason. 3. Catch up with e mails & blogs. Yep, but this is ongoing every day of every week. Doing it every other day or 3rd day seems to be working better though. 4. Do some work on my goals etc for Happy Club. Done! 5. Do some studying. I managed to finished the James Wood book (How Fiction Works) and I’m just about to start Bestseller by Celia Brayfield. Wish me luck! I think I’m gunna need it! This entry was tagged Celia Brayfield, Faber, Goals, To Do List, WIP, Writer, Writer Resources, Writers Resources, Writing, Writing Goals. Bookmark the permalink. Good luck, Vikki. I’m looking forward to hearing how your critique went. Scary, but so necessary. I wish you luck and all the best. I’m committed to writing each day this month. It doesn’t need to be a lot, but some each day. Good luck! I hope it goes well. My plans? Edit and vacation. More of one, less of the other. You’re such a trooper – you will do it. With all the lovely support I have I’m sure I will be. Vikki, so glad you are on the mend. It’s not easy to write through colds and such. Wish you good feedback on your next 5000 words 🙂 I have completed the last edits on my WIP, am taking one day off to catch up with the mundane and then go full steam on my next project. Look for it in the next few weeks !! The feedback was very helpful. A new project? Wonderful, I’m so jealous! Lol. Good luck honey. tent peg? thanks for the laugh! much needed! Two separate illnesses in the last seven days.!!….. well I always knew I had to have a cloned sister somewhere on this crazy planet. Now just to find a way to make back to back viruses look attractive…. God! who on earth would want to do that, the audience is thinking on the quiet…. Aha! Trick question…. it´s a way to distract myself in between the bouts of bronchial hacking. Still that´s not enough to stop me reading, and lord knows it´s about time I started catching up on all the wonderful posts in my neighbourhood blogisphere! Crossing my fingers literally and metaphorically for you and wishing you all the best …… gogirlgo! I can’t tell you enough how awesome you are. 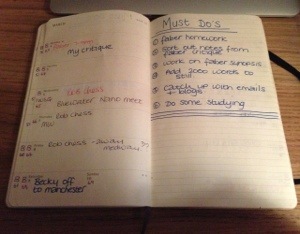 By now you would think I would know that you post your to-do’s on Mondays and that I would be prepared with my own list. That is not the case. My goal for the week is to get seriously organized by setting goals and blocking time. In other words, I want to be a mini version of you! I’m having a hard time getting there. Some weeks are better than others. I do well with a set schedule because it keeps me focused, but my life and my real job do not work that way. Ahhhhh, goal setting, that’s a great way to spend a morning! Good luck honey! I’m behind you 100%!!!!! !